La Sagrada Familia, originally uploaded by still awake. a funny fusion of form + material. apologies if silly question – where is this? 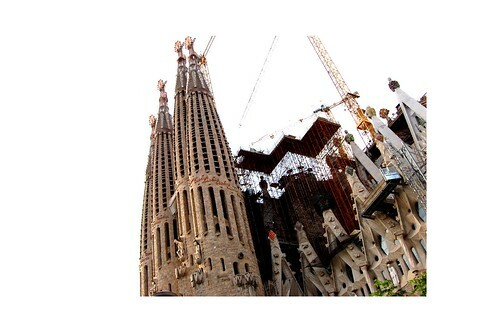 It’s in Barcelona James, An amazing city for photography, and the picture is of an unfinished church by Gaudi http://www.sagradafamilia.cat/ , http://en.wikipedia.org/wiki/Sagrada_Fam%C3%ADlia . It has been under construction since 1882! The church is an amazing site but then so is most of his work. The Sagrada Familia is one of my favourite buildings ever. As an ode to one man’s dedication (and inspiration) to God and as a statement of worship it has very little competition (except Mecca, for the latter). The scale and intricacy of it, the ongoing evolution of the design and the fact that the city is still prepared to see Gaudi’s vision through to completion is just staggering. I could go on, very few buildings in the world have struck me as much as this one has. I hope to be alive when the central spire (and the whole cathedral) is complete. It will then be something truly worthy of the term ‘awe-inspiring’.